Bubble is a perfect answer to any, “What’s for Breakfast?” question. It has a good number of eggs and a fair amount of milk to make it healthful and it has just a bit of sugar to make it slightly sweet. It’s especially attractive to kids everyone when adorned with beautiful cinnamon sugar apples. How could it not be? Apparently, the thought of having to make dinner last night came as a complete and utter shock to me at 5:30 when dinner time was rolling around. Even though it’s something I do nightly and usually have a plan, yesterday was a, “I have been running in 1,000 directions” kind of day and there was no plan in sight. Looking around my kitchen, like I was on a scavenger hunt for our dinner, I opened the fridge hoping to find a surprise slab of meat or whole chicken….no, no surprise meats. Then I went to the pantry looking for noodles and a jar of pasta sauce. Nope…..no sauce….no tomato paste….no chopped tomatoes, no fresh tomatoes…let’s scratch off the idea of any kind of pasta dish. Hmmmmm……maybe a sandwich would have to suffice tonight…that would do the trick. Bread? Nada!!! I was “0” for “three”. 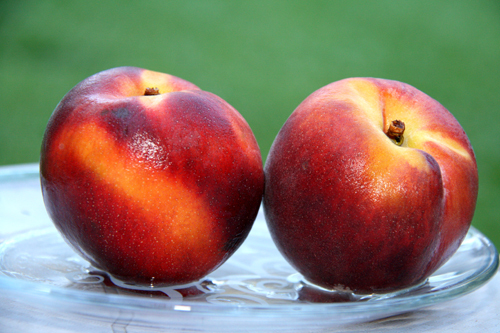 Finally, while feeling totally defeated on my little game I like to call “What’s for dinner?”, I saw my two glistening peaches calling out to me as if they had been jumping up and down the whole time just waiting to be picked. Reminds me of kickball in second grade, but that’s a different story. What can one do with peaches for dinner and no meat or poultry? Then it came to me….brinner! Brinner is dinner for breakfast around here and luckily for me my family usually is on board with this albeit most times it includes eggs and bacon. 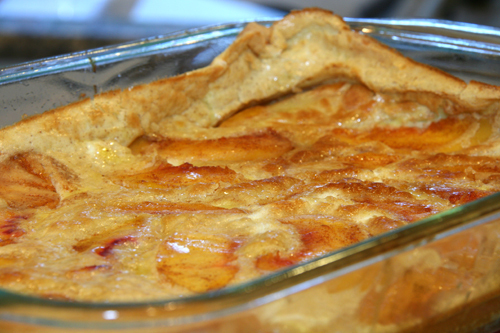 I had decided to revamp my delicious Dutch Apple Pancake to incorporate those lovely peaches.So that is what I did. I changed up my recipe to include some nutmeg because that just seemed like the right thing to do for those bright and cheerful peaches. It turned out better than I had envisioned, and we all sat down to our peachy puffy pancake and happily ate away. There was not any pancake left, and our stomachs were full so one more dinner down, and maybe one score for me tonight on my battle with the week. Heat the oven to 350 degrees and spray a 9×13 pan (or other similar dish) with cooking spray. Put all dry ingredients in a large mixing bowl and whisk together until all of the dry ingredients are adequately dispersed. Pour milk and beaten eggs into a large liquid measuring cup and SLOWLY add to the dry ingredients, beating with the whisk a little at a time so that you don’t end up with lumps. If you pour the milk mixture in all at once you end up with clumps of flour instead of a smooth batter. Pour your combined batter into the prepared baking dish. Mix 2 t. sugar, 1/2 t. cinnamon and 1/4 t. nutmeg together in a small bowl. Mix in the sliced peaches, to evenly coat them with the sugar and nutmeg mixture. Place peach slices on top of the batter, equally distributing them. They will sink, but when it bakes, they will rise to the top again. Bake for about 25-30 minutes…until golden and slightly firm. Place a few slabs of butter on top to melt and slather over the pancake. Slice and serve with additional peaches. That looks wonderful. 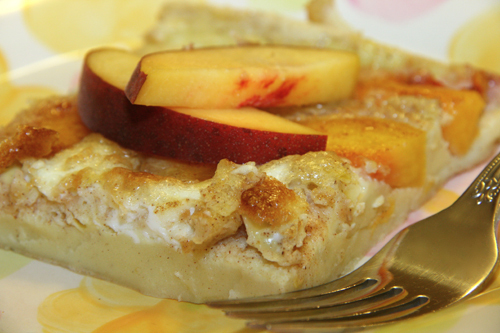 Peaches in a dutch pancake! Perfect. The best cooks are ones who can adapt and succeed with any changes. Oh I am SO ready for peach baking season! Bring.It.On. Specifically, with this puffy pancake. yum. Wow, this looks fantastically delicious! What a wonderful breakfast! Necessity really is the mother of invention, isn’t it? I love your “Brinner” solution and what a lovely way to use peaches. I have some of the first peaches right now, and never would have thought of making this pancake…it looks delicious! You have me craving yours no doubt about that! I just bought some Southern peaches, so I’m definitely making this for breakfast. I love seeing your reposts, since I’m sure I missed quite a few…and this one looks lovely – and perfect for ‘brinner’ – a staple meal at our house, too. This looks out of the world Geni! I’m definitely in for it. I made a peach breakfast cake last summer, and it was delicious. Never thought about using it in pancakes… so this is perfect! This just looks amazing. My dad always made us “dutch babies”- just dutch pancakes, but with no fruit, served with lemon juice and powdered sugar. Oh, and butter. I love them. I, honestly, have never had the fruit-studded version, but think I may have to do something about that now! I don’t care what you call ’em, Genie. Just make sure there’s enough for seconds and I’ll be happy! Ooh, this looks fantastic. I would eat it for breakfast, lunch and dinner. We are big fans of brinner around here, usually in the form of fancy scrambled eggs of some sort. I need to get the boyfriend to agree to pancakes for dinner! What a yummy looking breakfast treat! This looks so delicious and perfect for all the Texas peaches that will be cropping up here soon. Thanks for sharing. Also, I’m having a ChicWrap giveaway today that you should enter! Whoa, I can’t wait to try this! P.S. I love Brinner! Can’t wait for the stone fruit season here to try this puffy and delicious recipe! Thank you for reposting Geni, I totally missed this the first time around and I just know my kids would be over the moon if I made this. Wow, Geni, this looks freakishly amazing. If only you could make this and sell it at a bake sale, we’d raise tons of money! Okay I really need to find some fresh peaches so I can make this for Sunday brunch. Oh dear! More peaches! I sure hope there are peaches at the Farmer’s Market this week, I am in envy. What a fantastic Brinner! Oh this looks amazing! I’m so glad you reposted it. I’ll have to add it to my must make list. Ohhhh my, thanks for re-sharing this, it looks amazing!! I’m a big fan of brinner…especially if it’s a dish like this. 🙂 I usually just make scrambled eggs, so that’s clearly not as exciting. Yum! I love baking with peaches! I love the recipes from the early days of blogging. They are often our favorites and no one has seen them, hidden jems! Love this! A pancake recipe = YESYESYES. Your peachy pancake would definitely be a hit in my house. Yum! I’m in the same situation sometimes. It’s almost like I forget that I’m responsible for dinner yet again! This recipe would be a great way to solve that problem. Brinner! Love it! Having Dutch roots as well I swear I’ve seen a few iterations of this, but yours looks very yum!